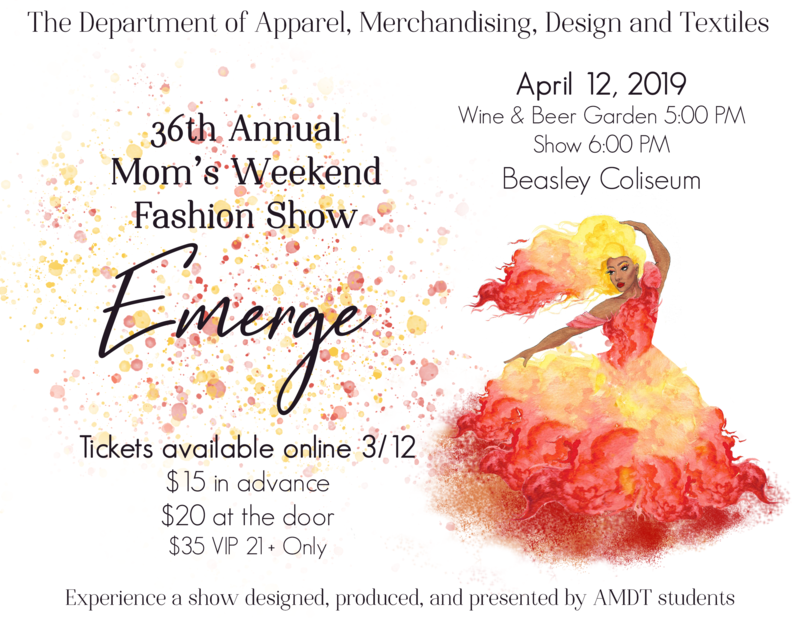 The 36th Annual Mom’s Weekend Fashion show is brought to you by WSU Apparel Merchandising Textiles and Design, Fashion Show Class. This year, Emerge theme will be featuring our 16 senior designer lines, as well as, other design students best work they have produced, thus far. Our AMDT senior designers concluded that Emerge resonates in their inspiration and designs that they are presenting this season. By definition, Emerge is relating to how the seniors are emerging designers. Although, to our designers, Emerge means so much more than that. Our designers are breaking fashion stereotypes and paving a new road for the fashion industry. Our designers are putting light on real occurring problems, within our industry. This year, you will see several lines all about inclusivity. Some designs that you will see are lines created for the average size woman, a collection that is gender fluid, and so much more.